The leftist student wing Students Federation of India (SFI) repeated history at Himachal Pradesh University as its candidates swept all posts in the Students Central Association (SCA) elections at University campus while the Congress backed National Students Union of India (NSUI), improved its tally and dominated the elections by bagging a majority of the seats in Shimla, Kangra, Una, Solan, Lahaul-Spiti and Sirmour districts. BJP associated Akhil Bharatiya Vidyarthi Parishad (ABVP) take lead in Mandi and Kullu districts, but it lost its stranglehold Hamirpur to SFI. In overall trend, NSUI claimed to bag 205 seats, the ABVP claiming 167 while the SFI has been pushed to the third position. 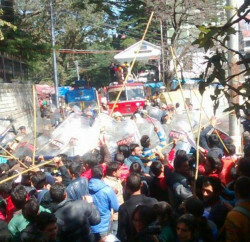 In HPU Shimla campus, SFI swept panel and its candidates Rajan Harta (president), Piyush Sewan (general secretary) and Monika (joint secretary) declared winner, while in the elections for departments representatives (Drs), the ABVP won 23 positions while the SFI took 22; one each were shared by an independent and NSUI. 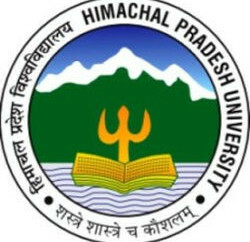 At Himachal Pradesh University, 65.04 per cent polling was recorded as 2,054 voters out of the total 3,158 cast their votes. In Shimla, the entire panel of the NSUI emerged victorious at the Centre of Excellence, Sanjauli., while the SFI made a clean sweep in the evening college and Rajkiya Kanya Maha Vidyalya. The ABVP won all the four seats at Rajiv Gandhi College, Kotshera. The NSUI made a clean sweep at DAV College, Kotkhai, Rajkiya Sanskrit Mahavidyalya, Jangla, Government College, Rampur, and Rajkiya Maha Vidyalaya, Sunni. However in Sanskrit College, Phagli, SFI supported candidate won president post while remaining three seats were bagged by the ABVP. At DAV College, Sawra Kuddu, the SFI won the top three seats and the NSUI got the post of joint secretary. The ABVP won all the seats at Government College, Theog, and Government College, Nerwa, and also captured three seats at Government College, Rohru, while the fourth was bagged by the NSUI. At Government College, Anni, the NSUI captured three seats and the ABVP the fourth one. The NSUI swept the student polls in colleges of Kangra district. The ABVP could manage to retain just Dharamsala Government College and Dhaliara Government College. The Regional Centre of HPU Dharamsala was dominated by the NSUI as it won all the four seats. NSUI also made a great leap at Shahpur, Thural, Maura, Jaisinghpur, Bagwan Government Colleges, Nagrota, and DAV College, Kangra, as the NSUI came out victorious. However, NSUI faced defeat at Pandit Sant Ram Government College, Baijnath, where ABVP clinched three seats and SFI get one and at Mandmiani College and Nurpur Government College, the ABVP won the entire panel. In Una district, the NSUI and the SFI jointly broke the citadel of the ABVP at SVSD College, Bhatoli as both student wing succeed to defeat ABVP. At government colleges of Una and Amb, which was predominately touted as a strong bastion of ABVP, NSUI shown great improvement and won the entire panel. At Bangana College, however, the ABVP won three seats and the NSUI one. At Dhaulatpur Government College, the NSUI won all the four seats. At Hamirpur and Badsar, the SFI candidates swept all posts and at Sujanpur and Nadaun colleges, leftist student wing secured three posts each. The ABVP won all four posts at Bhoranj College and three posts at Chakmoh College. At Sirmour the NSUI lead the tally with 12 seats in 7 colleges and the ABVP was second with 10 seats and the SFI pushed to the third with 5 seats. The NSUI swept the entire panel at Government Degree College (GDC), Shillai, while the ABVP got all four seats in GDC, Sangrah. At GDC, Nahan, the SFI won two seats, the NSUI and the ABVP one seat each. The NSUI bagged three seats in GDC, Paonta Sahib, while one seat was bagged by the Youth Brigade. At GDC, Rajgarh, the NSUI bagged three seats and the ABVP one. In GDC, Haripur, the SFI bagged three seats, the NSUI one. At Nahan Sanskrit College, the ABVP got the entire panel of four seats. In the Nalagarh Degree College, the NSUI secured three seats while ABVP had to satiate with lone seat. In Mandi, the ABVP swept polls in four colleges – Government College, Basa, Dharampur, Lambathatch and MLSM College, Sundarnagar, while arch rival NSUI won three seats at Government Vallabh College, Mandi. The NSUI swept poll at Paddar and a private college in Rewalsar. However SFI made its presence felt at Joginderngar and Sarkaghat colleges, where it won all the four seats. The SFI also won three seats at Karsog and the ABVP one. The ABVP won three seats at Sanskrit College, Sundarnagar, and NSUI one. In Kullu, the ABVP penal swept polls in Degree College, Haripur, while the NSUI won three seats in Degree College, Anni. The ABVP won three seats at Degree College, Kullu, while SFI won the seat of general secretary. In the Government Degree College, Banjar, the ABVP won two posts, SFI won president post and NSUI won general secretary post. The NSUI panel swept the Government Degree College, Kukumseri, in Lahaul-Spiti district.